← When Did Yarn Get So Addictive? In our commitment to community and the need for outreach. We’ve been wanting to create a map locating service to help The Crochet Crowd find groups and charities locating near them. We understand that it is not practical to ship donations across the country or even half way around the world when donations are needed in our very own backyards. With this new locating service, we hope to provide locations near our fans so they can make a difference. Organizations and/or charities looking for crochet based items such as blankets, hats, scarves and etc. We are not listing any charity that is wanting cash only. The organization must be accepting crochet donations on an on-going basis. Crochet Groups Meeting Locations. Maybe your public library has something? Maybe you are the organizer of a group in your area? Our mapping service extends the globe. We are not limiting listings to be only in Canada / USA. The new service has been added to the top menu of The Crochet Crowd Website. 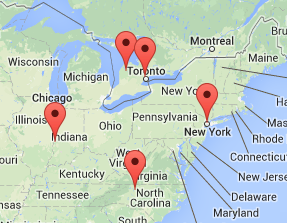 As listings are added, you will see the map evolve. The mapping will show you exact locations of the charities and groups to keep our mapping information legit. To see this map and/or learn how to get listed. Visit our new Group and Charity Locator Page. What do you think of this type of service? Share your comments with me below. This entry was posted in Charity Projects & More and tagged Charity, Crochet, crochet crowd, Crochet Group, Google, Locator, Map, Mikey. Bookmark the permalink. I am so happy you are doing this. Thanks. Great idea! I love this, now I can find charities that are local and help out. Thanks! Great idea, I’ll keep my eyes peeled and get back to ya! Great idea! I have wanted to contribute to a few charities but couldn’t because shipping was very expensive. I would love to find groups in my area. What a wonderful idea–truly inspired! Thanks for this and all the wonderful things you do. This is fabulous.Gets me thinking. Thanks also to the posters responding with their experiences, its helpful. That is awesome! I would love to give more crocheted items. I could give you a hug! Brilliant!!! I moved out of state and I left most of my stash and I’m missing it and having fellow crocheters to talk with. This will be great!!! I think this is long overdue! How many people want to help, or donate and can’t even begin to know where to look?!? Too many! It never occurred to me to actually try to start a service like this….You have the resources to do it right, too! Here, you can add us as a member! “Krewe de Fiberistas” located in the Milton, FL area (postal code 32570) let me know if you need more info than that! I think this is long overdue! Mike and the ‘gang’ can add Krewe de Fiberistas in Milton, FL USA (postal code 32583) to the site, if they like! I think this is great. Previously, I had been shipping blankets from Illinois to San Diego to a charity called Stitches from the Heart because I found it difficult locating charities in my area. Last year I participated in a challenge to crochet 12 hats for preemies that they asked you to donate to a hospital in my area. Turns out most of the hospitals would not accept these donations from an individual, only from organizations. I also shipped baby blankets to Parkland Hospital in Texas when they put out a plea on Facebook that they needed blankets. I hope this service grows and more organizations are listed so those of us who have the time to make these blankets do not also have to spend a fortune shipping them to other areas when they may be a need in our own area. Thanks Mikey. I’ve become a blanketeer member for our local southwest Missouri Linus Project and we can always use more blankets. The need is great. I think this is a great idea! I do make so many things for charity but then sometimes just can’t find anyone locally to take them.